If you want some new shirts, you just go to a store, look at their selection and choose the exact colors you want. After that, choosing colors gets a little harder. If you decide to paint your bedroom, you go to a paint store and choose colors you want from their selection of paint chips. Picking the right colors though can exercise your imagination a bit as you try to imagine what the colors will look like on your wall. Even when you take the paint chips home, the colors look different depending on whether you see them in light or shadow, artificial or natural light. But, once you finally make your selections, your colors are mixed for you. If you want to have something commercially printed, like business cards, you might use a Pantone Color Guide, shown at left, to choose colors of ink you want. 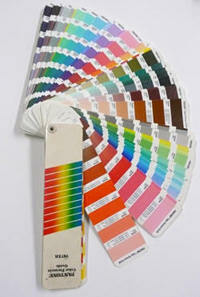 Pantone inks are generally used when a printed piece will have only one to three flat colors. Here again you have to exercise your imagination a bit to imagine how the colors will look together. But, you may have more money to spend and want something much fancier than a few flat colors. In that case, you could use the four-color printing process, like magazines use. If you are computer savvy, have the right software and want to specify exactly which color shades you want in which places, you can do it using pages from a Process Color Guide, like the one shown at left. This page shows you how yellow ink (upper left corner) combines with the inks, magenta (upper right corner) and cyan (lower left corner), to produce all the colors you see here. The fourth color, black, isn't shown on this particular page. There is a lot more imagination involved in this process than the ones I mentioned above. This is due to the fact that the color you see on your monitor is NOT how the color will look when it's printed. You have to trust the Process Color Guide, not your monitor. But, how do you choose colors you use in your paintings? Do you just try to copy the exact colors you see in your photograph? Do you use your imagination and change some of the colors? Do you ever come up with your own color scheme, one that's totally different from what you see? The famous illustrator, Norman Rockwell, used to only use black and white photographs for reference so it was easier to come up with his own color scheme. He found if he used color photographs he would start to copy the colors in the photo. 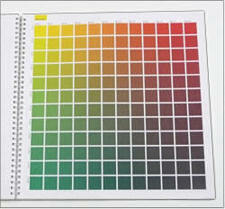 In my earlier years as an illustrator I found the Pantone Color Guide could do double duty. I used it, of course, when I wanted to have something printed, but it was also useful at times to choose colors for a general color scheme of a painting. I would fan out the colors and mix and match them until I got an idea of the general colors I wanted to use. Of course I still had to mix the paints, but at least I had an idea of what I wanted to do. These days there are many other options for artists. 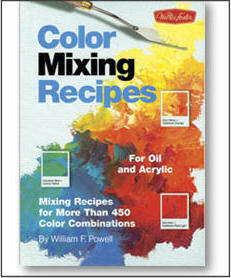 For instance, there are a number of books like the Color Mixing Recipes book at left for oil, acrylic and watercolor. This one shows many different color combinations and the formula for mixing each color. The formulas are a little more exact than most of us may be used to, but it gives you an idea of what to shoot for. And the color swatches are large enough to get a good taste of the color. I've heard some aspiring artists swear by this and other books of this type. By all means use whatever will help you gain confidence in mixing and using color. For my money though, Richard Robinson's DVD Mastering Color is still the best single source for the essentials of understanding and using color. In it a master painter leads you through everything you need to know to conquer this subject. And, whether you are an aspiring artist or an experienced artist, there is always something to be learned from someone else.